Another edition of Picture in Time for you today and it is Blackpool day again! This time we take a look at the lowest numbered Twin Car, 671+681. The motor of this pair started off life as English Electric Railcoach 281 entering service in July 1935 before being withdrawn in April 1960 to allow for its rebuilding as a Twin Motor Car. It became the fifth Railcoach to be rebuilt as a Twin Car with it entering service in this new condition in December 1960. As for its trailer – originally T1 – this predated its partner by five months although as with all of the Twin Cars they were not initially permanently coupled with this marriage not coming until 1962. The 1968 renumbering then saw the two become 671+681. 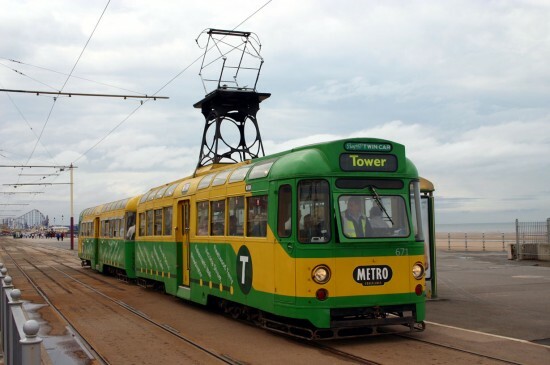 Continuing in service throughout the next few decades the set was one of five chosen for major overhauls in the 2000s at a time when the condition of the track to Fleetwood was in a precarious state. 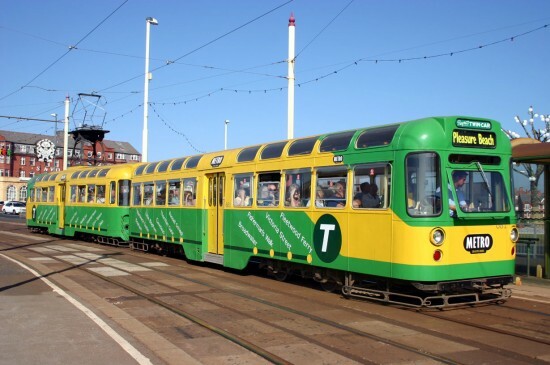 As well as low voltage systems the trams received a new livery with the Metro Coastlines Green & Yellow style chosen; the tram returned to service in this condition in April 2003. They were withdrawn from service in 2007 but they were resurrected for further operational although were taken out of service again at the end of 2010. Since the end of traditional tram operation the two halves of the tram have enjoyed long periods apart with various different owners although they are now reunited undercover at Rigby Road although remain unserviceable. These photos come from 2005 and in this image we see 681+671 at Gynn Square on a sunny 6th September as it operates a service to Pleasure Beach. And then on 10th September the motor is leading as they call at Manchester Square with a short working to Tower. This entry was posted in Blackpool Tramway, Picture in Time. Bookmark the permalink.